Is America’s Middle Class Really Shrinking? For several years now Americans have been having a lively debate about income inequality and the supposedly shrinking middle class. The American Enterprise Institute scholar, Mark Perry, has an enlightening new post on this topic. 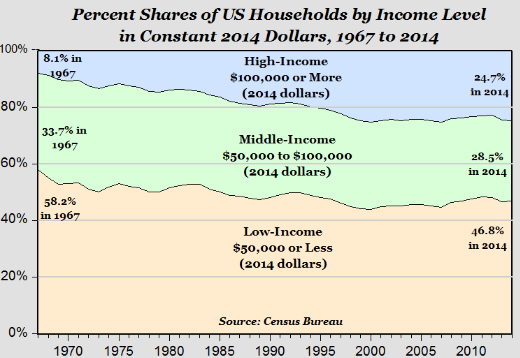 The AEI has produced a vivid graphic showing that the American Middle Class (defined as the middle 50% of Americans by household income) has dramatically increased in income from 1971 through 2001 but has been stagnant since the Great Recession in 2008-2009. Implement broad-based tax reform. Lower the rates for both individual and corporate taxes, paid for by closing loopholes and limiting deductions. Better yet, shift from taxing income to taxing consumption. Remove roadblocks to innovation by making it easier to start new businesses. Improve K-12 education, especially for low-income kids who need extra help. Enhanced early childhood education, more emphasis on career (vocational) education, and charter schools in big cities are the way to get this done. Make attending college more affordable. There are many good schools around the country which are not expensive to attend (the University of Nebraska at Omaha where I teach is one of them). College students and their families should make it a top priority to avoid huge debt. Attending a prestigious (and expensive) institution is simply not necessary to get a good education. There are other more controversial ways to speed up economic growth such as increasing international trade and reforming our broken immigration system. But just the measures above will go a long way and shouldn’t be that difficult to implement. This entry was posted in AEI, American Enterprise Institute, Jack Heidel, Mark Perry, Middle America, middle class, middle-class economics and tagged economic growth, jack heidel, Middle class, tax reform by jackheidel. Bookmark the permalink.